Scud vending machines aren't always empty when they get refilled. There's a robot out there that always gets shoved to the back. 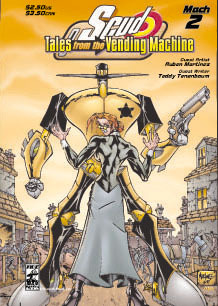 "The Scud with No Name" is a western style yarn, spun by screenwriter Teddy Tenenbaum and drawn by Ruben Martinez.